She is resplendent like the rising sun and wears a bright moon disc on her brow. She is adorned with a crown and a necklace of jewels. She is bent down due to the weight of her large breasts, and in her hands she holds two lotuses and two bunches of rice shoots. She has three lotuslike eyes and has a smiling face. The name Kamala means ‘she of the lotus’ and is a common epithet of the goddess Laksmi or Sri, who is said to be adorned by lotuses and to be lotus eyed and surrounded by lotuses. Indeed Kamala is none other than the goddess Laksmi. Of all the goddesses in the Mahavidya group, Kamala is the best known and most popular and has the oldest tradition of worship outside the Mahavidya context. She is a goddess with auspicious, benign, and desirable qualities. She identifies with worldly blessings found in ordinary religious practices: wealth, power, good luck, and safety. Early references to Kamala call her Sri: auspicious, her positive qualities are identified with food, royal power, luster, fortune, and beauty. She gives wealth and other desired objects to her devotees, is beautiful and adorned with costly ornaments, and is associated with fertility and growth. The lotus seems to have two general meanings. First, it is related to life and fertility – the yoni, female genitalia. 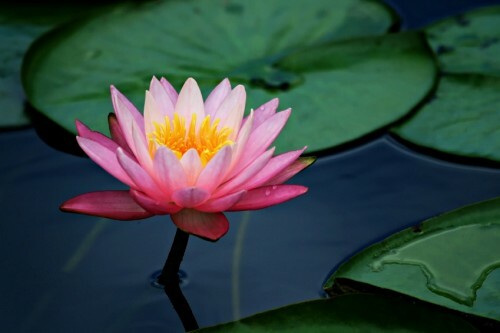 On a cosmic scale, the lotus represents entire created order. The cosmos as lotuslike suggests a world that is organic, vigorous, and beautiful. It is the fecund vigor suggested by the lotus that is revealed in Sri. She is the life force that pervades creation. Second, especially in relation to Sri, the lotus suggests spiritual purity, power, and authority. The lotus seat is a common theme in Hindu and Buddhist iconography. Gods, and goddesses, buddhas and bodhisattva’s, are typically shown seated or standing on a lotus. Like the lotus which is rooted in the mud but whose blossoms are uncontaminated by it, these spiritual beings are understood to transcend the earthly limitations of the world (mud of existence). 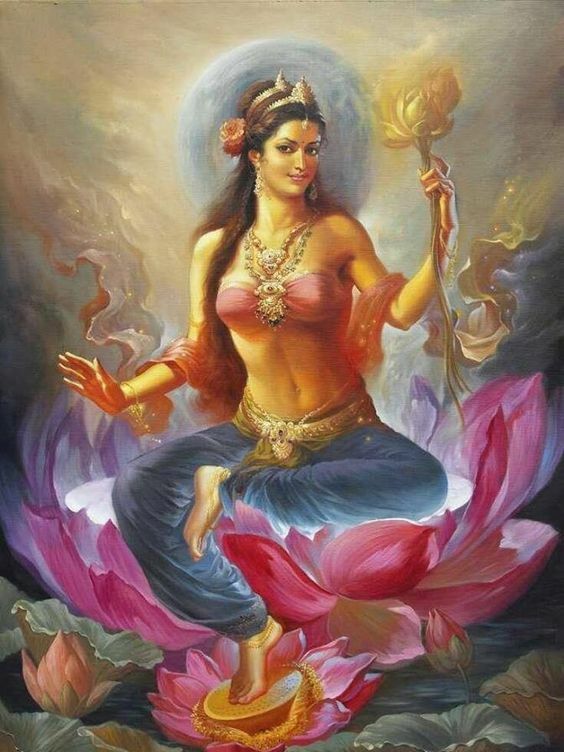 Sri’s association with the lotus suggests that she symbolizes a certain perfection of state of refinement that transcends the material world, yet is rooted in it. She has a beautiful golden complexion. She is being bathed by four large elephants who pour jars of nectar over her. In her four hands she holds two lotuses and makes the sign of granting boons and giving assurance. She wears a resplendent crown and a silken dress. Sri’s association with the elephant suggests other aspects of her character that are ancient and persistent. One of the most common representations of Sri shows her flanked by two elephants that are showering her with water from their trunks. The elephants have two meanings. According to Hindu tradition, elephants are related to clouds and rain, and hence fertility. Second, elephants suggest royal authority. Kings kept stables of elephants, which they rode in processions and used in military campaigns. Kings were also held responsible for bringing timely rains and for the fertility of the land. In appropriating the great and widely worshiped goddess Sri-Laksmi as a Mahavidya, the formulators of the Mahavidya tantric texts modified and tailored her character, it seems, to make her more suitable to the group. Indeed, her inclusion among the mahavidyas is not easily explained, and her place in Tantrism, the primary context of the Mahavidyas, seems somewhat out of character. Kamala’s role among the Mahavidyas is a recent and minor part of her cult and worship in Hindu tradition. Unlike other Mahavidyas, such as Dhumavati, Bagalamukhi, and Matangi, who are barely known outside the Mahavidya group, Laksmi is an ancient and extremely popular goddess, worshiped throughout India in a variety of contexts and sectarian movements. In conclusion, it may be helpful to understand the contrasts of tantric religion and worship between that of Sri Lakshmi and Kali Ma. Lakshmi assists those who are seeking wealth and worldly comfort. Whereas Kali worshipers seek to heroically and boldly confront the darkness, demanding ultimate knowledge. Kali is described as a goddess with whom one must struggle, Lakshmi as one who pampers her devotees but ultimately is incapable of giving such supreme blessings as liberating knowledge. In other words, Kamala represents a state of consciousness preoccupied with material well-being and security. That is, she represents the normal state of consciousness in almost all people and, as such, the starting point in the process of spiritual maturation. Kamala consciousness is what one seeks to restrain, overcome, and finally transcend. Kali consciousness is the ultimate goal of liberation.